Italian Talmudist of the eleventh century. 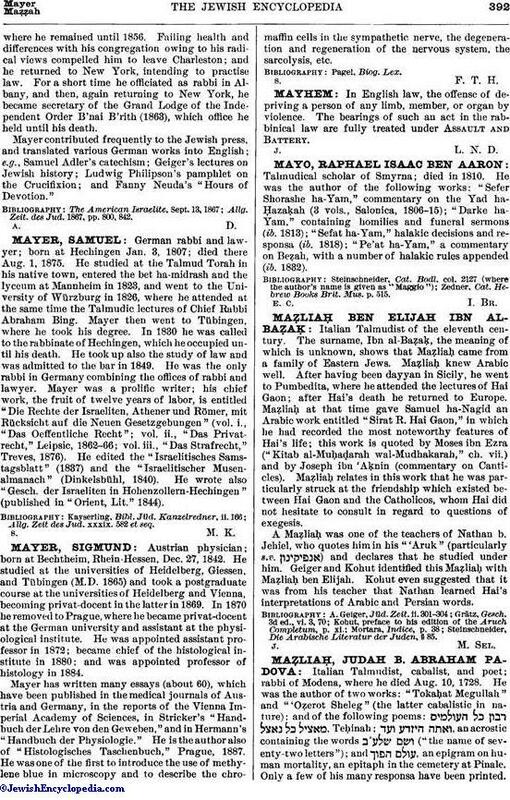 The surname, Ibn al-Baẓaḳ, the meaning of which is unknown, shows that Maẓliaḥ. came from a family of Eastern Jews. Maẓliaḥ knew Arabic well. After having been dayyan in Sicily, he went to Pumbedita, where he attended the lectures of Hai Gaon; after Hai's death he returned to Europe. Maẓliaḥ at that time gave Samuel ha-Nagid an Arabic work entitled "Sirat R. Hai Gaon," in which he had recorded the most noteworthy features of Hai's life; this work is quoted by Moses ibn Ezra ("Kitab al-Muḥaḍarah wal-Mudhakarah," ch. vii.) and by Joseph ibn 'Aḳnin (commentary on Canticles). Maẓliaḥ relates in this work that he was particularly struck at the friendship which existed between Hai Gaon and the Catholicos, whom Hai did not hesitate to consult in regard to questions of exegesis. A Maẓliaḥ was one of the teachers of Nathan b. Jehiel, who quotes him in his "Aruk" (particularly s.v. ) and declares that he studied under him. Geiger and Kohut identified this Maẓliaḥ with Maẓliaḥ ben Elijah. Kohut even suggested that it was from his teacher that Nathan learned Hai's interpretations of Arabic and Persian words. Steinschneider, Die Arabische Literatur der Juden, § 85.